How many moms have heard that from their little ones who are convinced they know better? Well, apparently it carries across species, because this little lion cub is very stubborn! 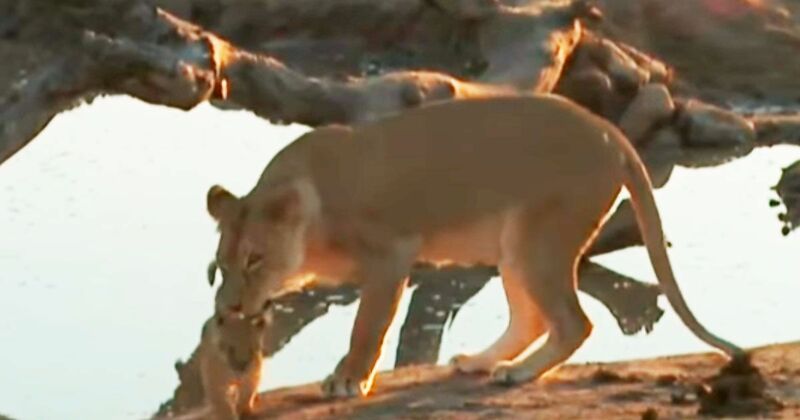 In this great video, you can see the cub heading towards the water, and mom quickly following and picking up the cub to carry him away. And what does the cub do in response? Head right back to the water. Of course. As Animal Planet points out, lions are capable swimmers, but generally avoid water and dislike it. The reason momma is keeping her cub from the water is because it could actually very dangerous, especially for the little one. African crocodiles are frequent inhabitants of the bodies of water in Africa, so she just wants to keep her baby safe! Of course, when he doesn’t listen (again, and again), you’ll notice that she picks him up with her mouth by the scruff of her neck. It looks rough, but it’s actually incredibly gentle. As Mr. Goldstein explains to the Daily Mail, momma cats carry their young until about five weeks, when they get to be a little too big. When they’re little, though, the skin on their neck is tough enough that being picked up like that actually doesn’t hurt at all. How cute was that video? Does it remind you of a time with your own child or another kid in your life? Share it with your family and friends, and comment below with a story of your own little stubborn cub!